Killer Bee [Seven Swords Style] is the Eight-Tails Jinchuriki from Village of the Clouds. He is unique compared to other ninjas who is aspired to be one of the greatest rapper. Killer Bee joined Ay [Fourth Raikage] as a tag member as he is the only person successfully perform Lightning Release: Double Lariat with Ay. There are 2 Killer Bee in Naruto Online game, where another character with Samehada sword. Taijutsu Yo[Prompt]: Will give an additional Extra Standard Attack to a selected unit of your Lineup each round (cannot stack up with other Extra Standard Attacks given by other ninjas), the selected unit will also be immune to Interruption, lasts for 2 rounds. Taijutsu Seven Swords Stream: Attacks the opponent’s front row with 7 COMBO and has a chance of Knockdown. Ninjutsu Tailed Beast Instructor: In the beginning of a battle, up to 9 Jinchuriki ninjas from your field, will be given a Shield based on 40% of the Jinchuriki’s Resistance base attribute, their Ninjutsu and Attack will also be raised by 30%, lasts for 3 rounds. Taijutsu, Ninjutsu Lightning Plough Hot Sword: Chases and Attacks a Knocked Down unit, also causes High Float and Paralysis. 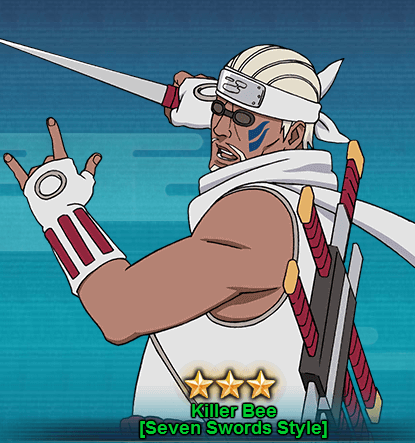 You can get Killer Bee [Seven Swords Style] from the Kage Treasure. It will take almost 60-70 seal scrolls draw to get Killer Bee.